CS:GO is still the one of the most popular games in India, and 2018 marks Season three of the Indian Qualifier for ZOWIE eXTREMESLAND 2018 CS:GO tournament. LXG is proud to announce a third year of partnership with ZOWIE to bring gamers all over India a chance to compete with the best CS:GO talent across Asia.  This year marks for the first time in Indian eSports a Direct Invitational Qualifier round along with online and LAN qualifiers hosted in four different cities. Kicking off on the 13th of August and going on till the 9th of September, the winning team from India will be sponsored to represent India during the finals in Shanghai to take a crack at the 100,000 Dollar prize pool! ZOWIE being the title sponsor of the tournament aims to provide the opportunity for new and lesser known teams a chance to prove their talents. The registration deadline for the Online Qualifiers is 16th August 2018, 11:59 pm. The registration deadline for the Offline Qualifiers is 23rd August 2018, 11:59 pm. Registrations are online at: click here. Rules are available at: click here. Watch the action live at: click here. Phase One is an invitational round on the 13th and 14th of August. This round features eight teams from India battling it out for two spots at the India LAN Finals at LXG Bangalore. This round will see Entity Gaming, the winners of the 2017 cup return for another chance at glory in 2018. Other teams in the brackets include ATE Gaming, Brutality, MaG PuneFive, OpTic India, Team Invictus, Team Malhar and 2ez Gaming. All games until the finals will be played as Double Elimination best of three matches, with the finals being best of three games with a 1 map advantage to the winners of the upper bracket. Phase Two is the online qualifier on the 18th and 19th of August. This round is open to any participant from anywhere in India that meets the requirements as per the rules and regulations of the tournament. 128 slots are open for teams to register to participate, and battle it out for the top four slots that will take a team to Phase Four: The Decider Qualifiers will follow a Single Elimination best of one format until the finals, which will be a best of three. Phase Three consists of four offline qualifiers on the 25th and 26th of August. This round will be played simultaneously at different cafes in four cities – GCC at Mumbai, Playmax at Hyderabad, E-Sports Fight Club at Bhubaneswar and Playbox in Jaipur. 32 slots per venue are available for participants to battle it out for the top slot per city that will take Four teams to Phase Four: The Decider Qualifiers. The offline qualifiers will follow a Single Elimination best of one format until the finals, which will be a best of three. Phase Four is the Decider Round hosted on the 25th and 26th of August. This is an online round played by the top four teams from Phase Two starting in the lower bracket and winners from each city from Phase Three in the upper bracket. The top two teams will make it into Phase Five, the India LAN finals at LXG Bangalore. Phase Four will follow a Double Elimination best of three format. Phase Five the India LAN Finals round hosted from the 6th to the 9th of September at LXG Bangalore. Four teams will fight it out for the top spot and an all-expense paid trip to represent India at the finals in Shanghai. ZOWIE will be sponsoring the travel and stay for the top two teams from Phase One and Four to the India LAN Finals at Bangalore, and for the winner of this round to represent India at the Asia Finals at Shanghai. Stay tuned to the blog for more updates on all the action!